Consumer brands are seeking out deeper connections with customers and that starts with a dedicated workforce. The workplace is now another opportunity for companies to represent their values and mission in new ways. A personal connection to the company’s overall mission is crucial for employees to reach their aspirations. The design team felt employees and consumers should drive each other in the workplace. Known for their brand loyalty, Red Bull connects with costumers on multiple levels. It was essential that their employees in their Southeast office were just as engaged. The experience goes beyond the energy drink. The office is more than a place to work—it’s a destination for employees to socialize and explore ideas. The experience starts as soon as people enter the office. The reception desk doubles as a drink bar. 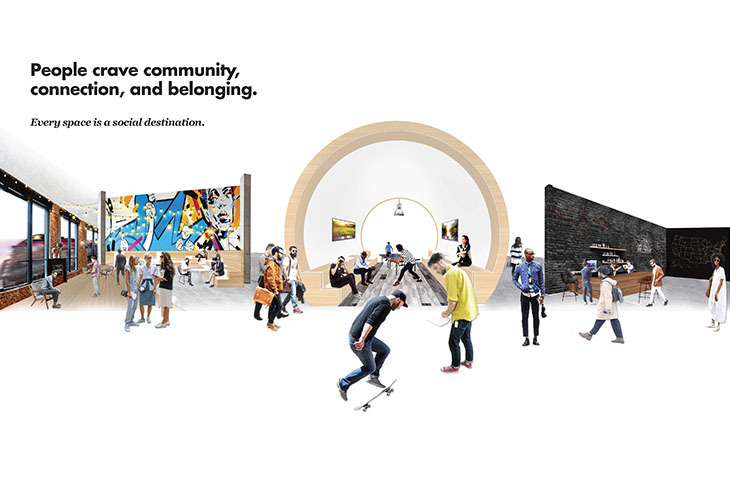 Visitors and employees enter an atmosphere where the product can be shared and enjoyed together as a social community. The former livestock warehouse sits on the westside of Atlanta known as the Stockyards. Details like old bricks and concrete beams compliment the loft-like design to make employees feel at home. The signature feature takes advantage of the 20-foot high ceiling. Inspired by the iconic Red Bull can, the Activity Can evokes the same level of energy that opening an actual drink provides. The can’s interior is a space where employees can play and release stress. Murals by local artists Peter Ferrari and Sanithna Phansavanh wrap around meeting and gathering spaces. Conference rooms meet the past with the present and are finished with barn doors. The design gives several nods to southern hospitality. Signage made from a variety of materials, such as neon and grass, feature messages to encourage conversations. The breakroom is referred to as the “back porch.” The area is complete with garden lights and a fireplace. The team was careful to simultaneously preserve the character and structure for another 100 years. It was important to be true to the existing materials from the industrial building shell and find authentic ways to stitch the old with the new framework. The building’s strong history and contemporary update forms a deeper relationship to the city. The experience is fully immersive as people hear the trains passing by outside the building. The Red Bull Atlanta office is curated for employees to engage in an inclusive environment. The design positions social destinations and brand messages throughout the workplace to cultivate individuals with likeminded passions. The modern yet vernacular aesthetic further establishes a distinct workplace. The result is a space that supports a common ground for everyone to express their highest potential at work. Working at Red Bull can give you wings! Meena Krenek is an award-winning design director at Gensler, who has transformed her clients' companies, strengthening their corporate cultures through experiential design. Meena focuses on creating environments that are inspiring and unique to the needs of each client’s business. She is focused on integrating architecture and interior design to create solutions that encourage emotional connections with space. She has a keen ability to develop tailored design solutions that positively influence her clients’ business and culture. Contact her at Meena_Krenek@Gensler.com. Gail Malone is a Senior Associate and Interior Designer at Gensler, who brings strength and versatility to all of her jobs with the capability to manage, design, and deliver exceptional project work. In her 21 years of experience, Gail has worked on a wide range of projects, from on-call accounts to one-time accounts. She is extremely strong in building long-term relationships with her clients, and she thrives on delivering excellent projects that are thoroughly documented, on time, and within budget. Gail is the Design Realization Leader for the Workplace studio in the Atlanta office. She is also an active leader of Gensler Atlanta’s Community Impact Committee. Contact her at gail_malone@gensler.com..